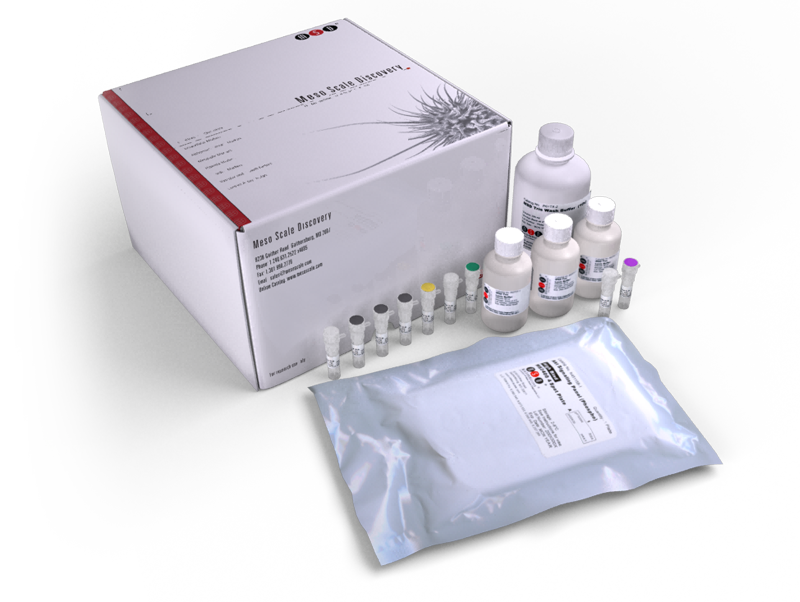 The Inflammation Panel 1 (rat) Kit provides assay-specific components for the quantitative determination of lipocalin-2, thrombospondin 1 (TSP-1), tissue inhibitor of metalloproteinases (TIMP-1), and monocyte chemoattractant protein-1 (MCP-1) in rat serum and plasma. Increased levels of proinflammatory cytokines play a pivotal role in the pathogenesis of inflammatory diseases such as atherosclerosis, rheumatoid arthritis, and acute and chronic kidney injury. TIMP-1 and lipocalin-2 expression is indicative of inflammatory action following infection, ischemia, and endotoxic insults to the endothelium and stromal matrix. TSP-1, a key activator of TGF-β1, mediates wound healing, cell proliferation, and extracellular matrix formation at sites of injury and bleeding. TSP-1, secreted in response to inflammation, promotes the resolution of the inflammatory process and facilitates phagocytosis or apoptosis of damaged cells, protecting tissues from excessive damage. MCP-1 is uniformly upregulated at sites of vascular disease or injury and is one of the earliest cellular responses to atherogenesis.